Pre-heat oven to 350 degrees. Combined rosemary, cheese and Canadian bacon in a small bowl. use a sharp knife to cut a pocket in the thickest part of each chicken breast. Stuff the chicken breasts with 2 tablespoons cheese, Canadian bacon and rosemary mixture. Secure the "pocket" closed with a couple of toothpicks. Heat a skillet sprayed with cooking spray on medium high heat and place the chicken in it...cooking it on both sides for 2 minutes. Transfer the chicken onto a sprayed cookie sheet (or foil on a cookie sheet for easy clean up) and cook in the 350 degree oven for 20 minutes or until chicken is no longer pink in the middle. 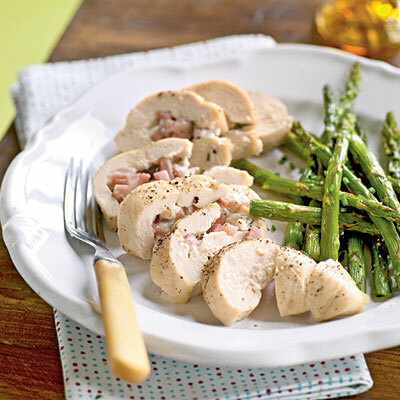 Each chicken breast is approximately 285 calories...and super delicious! Serve with a favorite veggie...like asparagus! Perfect salad for hot summer nights! 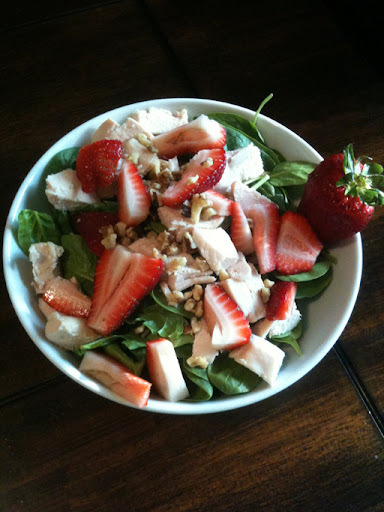 Try combining lots of spinach, strawberries, grilled chicken, a few walnuts and a dash of raspberry hazelnut vinaigrette...perfect for a hot summer night and packed with nutrition! Feeling good and living life to its fullest are my passions. I found that exercise and food help me do both of those things while being a friend, wife, mama, coach, trainer and all sorts of other roles. My goal as a health coach is to find simple but powerful ways to improve people's sleep, body image, gut health and longevity. I hope that some of my little posts speak to you and help with even a tiny bit of every day life. Please comment and let me know what you think or what you do to feel your best and live life to the fullest!